I have written in Revolutionary Tennis linear momentum is our main source of body momentum to empower/support the stroke, and that angular momentum, a.k.a. 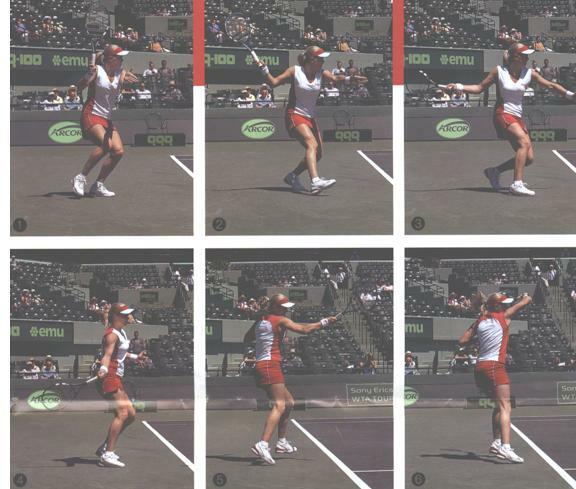 body rotation, is counterproductive to a tennis player’s success. This proposition raises a lot of eyebrows because pros, organizations, celebrities, and self-styled elites love to point out that it is angular momentum out of the semi-open and open stances, that is body rotation generated by the legs, hips, shoulders, that leads to racket acceleration, or power. Well, would you like to know that loading on the back leg is called “horizontal linear momentum,” and that the leg drive upward off the back leg is called “vertical linear momentum,” and that its push forward is called “horizontal linear momentum”? I kid you not, as outlined below in a USTA High Performance Newsletter to Coaches that ironically is not offered on their web site either for review or download. And I wonder why not. Possibly because of the confusion it engenders, the many unanswered questions it raises. 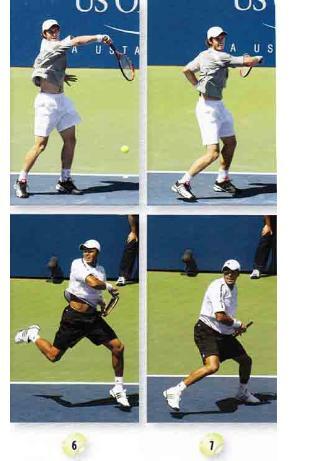 This all begs the question: IF leg drive (vertical and horizontal linear momentum) is “critical for ... and the development of high racket speed” why do the authors say “significant rotation” of “hips [and] shoulders” in the photos is “indicating a powerful stroke”? This is terribly misleading because what players take out of all of this is to enact “significant rotation” of their bodies to develop a powerful stroke, and if you’ve tried this I’m sure it leaves you frustrated. A better question to investigate is why and how does this linear momentum set the table that leads to the “powerful stroke,” and whether or not it, and not the opening of hips/shoulder, is primary for power and stroke consistency. In other words, if I have leg drive do I get the powerful stroke? Or if I do not have leg drive do I get the powerful stroke only by rotation? From the USTA’s High Performance Coaching, The Newsletter for Tennis Coaches, Vol. 9, No.3. Comments in red are Revolutionary Tennis. 1. Open stances are situation specific. 2. All ground strokes require both linear and angular momentum. The forehand ground strokes featured here are hit with an open stance. One of the main reasons the players are able to use an open stance is that, although they are just inside the baseline, they have plenty of time to set up. If the incoming ball was lower and shorter, each of these players would have "squared off" his forehand significantly. Both players are clearly looking to go on the offensive and are in the process of hitting a very aggressive shot. As you will see in the explanation of the stages of these strokes, there is a significant linear AND angular momentum contribution in each of the forehands. Linear momentum is a product of both mass and velocity and can be generated in both a vertical and a horizontal direction. Angular momentum refers to the rotational component of the stroke and takes into account both the moment of inertia about an axis (resistance to rotation about that axis) and the angular velocity about that axis. Without getting too technical, it is important to realize that both linear and angular momentum are fundamental for the successful generation of power in the forehand. The amount of linear momentum created affects the amount of rotation force that's generated about each of the body segments (angular momentum) and vice versa. Therefore, both play an integral role in the success of the ground strokes regardless of stance. As linear momentum is developed in a straight line and angular momentum about an axis of rotation, coaches often associate a square stance with the former and an open stance with the latter. Conceptually, this link makes sense and may assist with one's understanding of the terms; however, stroke production - regardless of stance - relies on both linear and angular momentum. Let's take a look at how these two players employ both linear and angular momentum to their open stance forehand strokes. In the first three pictures, we can clearly see that both Andy Murray and Jo-Wilfried Tsonga are looking to hit a very aggressive forehand. They are clearly inside the baseline and preparing to hit with an open stance. From Photo 1 to Photo 2, you can see the weight transfer from the left leg to the right leg. This weight transfer shows the horizontal linear momentum necessary to plant the right foot. [i.e. "Loading" on the outside or back leg is horizontal linear momentum.] Even though the linear momentum is in the opposite direction of the stroke, it is important to load the right leg. This helps to prepare the leg for its drive, predominantly upward (vertical linear momentum) but also forward (horizontal linear momentum). This leg drive (or triple joint extension: ankle, knee and hip), which utilizes ground reaction forces, is critical for linear to angular momentum transfer and the development of high racket speed. [The potential for “high racket speed” is present with this leg drive but does not guarantee said “high racket speed” will happen. Calling this leg drive "critical" to "transfer... linear to angular momentum” inevitably leads one to think more leg drive will be better, but it’s not because you’ll look like popcorn popping.] Photo 3 shows it beginning to unfold, with mostly vertical linear momentum being produced. The subtle differences in the right (and left) foot plant of the two players (Photo 2) offers some explanation for the more pronounced leg drive used by Tsonga (as evidenced in Photos 4-6). Note the amount of both hip and shoulder rotation. The shoulders are typically rotated more than the hips by about 20 degree, which is observable in the strokes of both players (Photo 3). This is commonly refereed to as the separation angle. The vertical linear momentum phase as been completed, evidenced by the full knee and hip extension in Photo 4. [Only vertical linear momentum, or upward? What about horizontal linear momentum, the forward component, is it present here or not?] Forces have been transferred and we can see the hips opening up first, followed by the shoulders. [Therefore, in the graph above, ”leg drive... is critical for linear to angular momentum transfer and the development of high racket speed,” the word “transfer” means it’s done through the "hips opening up first, followed by the shoulders"] Both players show significant rotation indicating a powerful stroke, further evidenced by the right foot coming off the ground (Photo 5). This is where angular momentum (of the trunk and then the rotating upper limb) contributes significantly to the speed of the shot. At contact, the resultant high swing speed (and linear momentum) of both players' rackets allows the linear momentum of the incoming ball to be easily overcome. Photo 6 and 7 show the completion of the stroke. The amount of rotation (note how far the right leg comes around) points to the effectiveness with which both players coordinated the linear and/or angular contribution of each of the body parts involved. [Does this mean more “amount of rotation,” and more “right leg comes around” = more effectiveness? No, the "effectiveness" of said coordination lies in the ball staying in, the work-to-result ratio not tilted too much toward work, and the player looks balanced and coordinated regardless of form used.] The fact that both players are farther in the court than at the beginning of the swing (see the position of the right shoulder) is a product of the shot's horizontal linear momentum. The follow-through is also dictated by the differences in objectives (Tsonga hitting inside out and Murray hitting cross-court). The interplay of linear and angular momentum is what makes the forehands so successful. Leg drive = vertical (upward), and horizontal (forward) linear momentum. 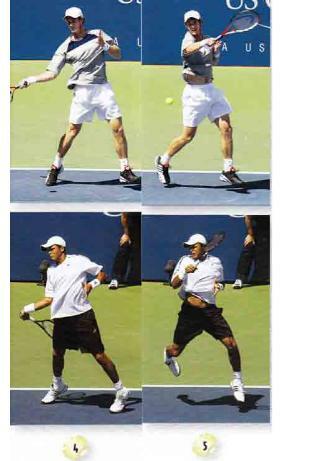 Leg drive = "critical" for linear to angular transfer and the development of racket head speed. Transfer = hips and shoulders opening, or rotating. Note is says AND the development of high racket speed, not FOR the development of high racket speed. Therefore the opening of the hips and shoulders, the torso rotating, is not in and of itself “critical” for the development of racket head speed. But then: “Both players show significant rotation indicating a powerful stroke.” We now return to rotation (“significant”) as the nexus of the powerful stroke. In other words rotation, not leg drive. So which one is it? If you say leg drive is “critical” then players do too much and look like popcorn popping. You say “significant rotation” = indicates “a powerful stroke” then players do too much and become spinning tops. Leg drive (linear) is “critical” for the development of high racket speed, but only as long as the transfer from linear to angular results. 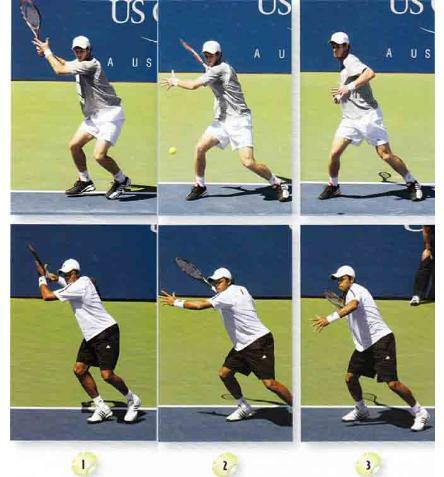 This transfer, as indicated in the USTA newsletter, is about the hips and shoulders opening, the torso rotating, but this USTA newsletter does not address how much the hips open, how much the shoulders open, whether or not they do so in tandem, what is their objective, how much opening is required to achieve maximum acceleration with maximum torque, and whether or not opening the body helps or hinders the linear momentum of the stroke itself. Just how does leg drive feed the angular momentum that follows? How can angular momentum be disciplined so it does not destroy the entire process and the player lose control over the contact moment? What happens when you drive your car as fast as it can go? You lose control, and the same thing happens when we boost angular momentum for the stroke. It’s easily seen in golf where, even though the ball lies motionless, large twisting or body rotation to try to accelerate the club leads to lack of contact control. In tennis we move to the ball, linear momentum, load weight and shift weight, linear momentum, and it is then we engage “the” power source (angular momentum) for the stroke? I think not. So there you have it, a sport which on the one hand talks about the presence of linear momentum throughout the stroking process but highlights the “powerful stroke” coming from angular momentum of hip and shoulder rotation. Or if you want to prevaricate by saying it is the “transfer” from linear to angular that creates the powerful stroke, they why not explain how to mitigate, modulate, manage, or master this transfer other than saying “leg drive” is “critical” and “significatn rotation [indicates] a powerful stroke”? Revolutionary Tennis has stated body rotation will appear on its own without any teacher’s input because it is a natural thing, and that if the teacher asks for hip/shoulder “turn” and “rotation” the student will certainly do this but unfortunately do too much of it to the point of hurting their stroke’s efficacy. Why? Because this is the simplest instruction set to grab onto. Miss-hits, lousy hit, over-hits, and poor timing are all a result of too much body involvement (body rotation, or angular momentum) during the commission of the stroke. Linear before angular, angular feeds off linear. Because our sport is one where we move. Hence the forward component for every strike: shift body weight forward into the strike, don’t shift weight upward, don’t shift it away from the strike if you really want to get it. Without that you’ll rotate yourself silly and only wind up hurting your body and your game. Here is Roddick from an earlier web page. His forehand return finds him pushing not forward and into the ball but off to his left, though he shows substantial body rotation. Federer below clearly pushes, or drives himself, forward on a forehand return, and his rotation is much less pronounced for it. Everyone knows we must “load” body weight to develop a powerful stroke, it’s the expression of athleticism: shift-then-execute. Duh. As in shift and throw the jab, shift and throw or shoot. But the secret lies in unloading our body weight in such a particular way to not adversely effect our swing’s efficacy (arm leverage and elasticity and timing notwithstanding). Therein lies the Holy Grail to our game, to any athletic expression. The Unloading Principle, and those who do it best are always described as elegant, has nothing to do with the kinetic chain as is commonly written, has nothing to do with overall physical strength though physical strength will improve one’s ability to Unload best, has little to do with the traditional understanding of extending for a greater moment of inertia or engaging more muscle groups. Conventional wisdom talks about one muscle group feeding into another, and a subsequent one feeding off of a preceding group’s contribution, but no one, absolutely no one, talks about how this is done best or what the contributions should be along the way. Revolutionary Tennis will be the first to try to explain how to do it. I will leave the why-ness to the work of scientists and analysts, a pro’s work is the smacking of the ball and communicating same. Stay tuned. And it’s easier than you’d think. I think I’ll call it the 3-1-2 concept, or Chicago for short. Gotta love the American midwest.